An Egyptian court has sentenced a man to one year in prison and fined him EGP 10,000 (1,427 US dollars) for verbal sexual harassment, reported Aswat Masriya. The man, in his 20’s, had been accused of verbally harassing a woman at the Dokki Metro station. The woman reported the incident to a local police station where a report was filed and charges were laid. A Cairo court found the defendant guilty of attacking the modesty of the victim, added Aswat Masriya. While five sexual harassers were found guilty on various charges last year, this is the first case under new anti-sexual harassment laws in Egypt. In a statement to Aswat Masriya, Mostafa Mahmoud, from Nazra for Feminist Studies and the attorney of the victim, said that the rulings help in controlling the increasing cases of sexual harassment in Egypt, adding that the rulings encourage women to take legal action against their abusers. Egypt’s Justice Ministry had amended to existing laws on harassment after vows to crackdown on the sexual harassment epidemic that Egypt faces. According to Al-Ahram, the law, for the first time in Egypt’s history, defines sexual harassment and places strict punishments on those found guilty of harassment. Anyone found guilty can be sentenced to a minimum of one year and a maximum of 10 years and can be fined anywhere between EGP 10,000 and EGP 20,000. Those in ‘superior positions’ (i.e. a supervisor in a school or at work) found guilty risk a 3-7 year sentence. Meanwhile, those who engage in mob harassment attacks (two or more people) can be jailed to up to five years. Furthermore, repeat offenders can be sentenced to 3-15 years in a maximum security prison. 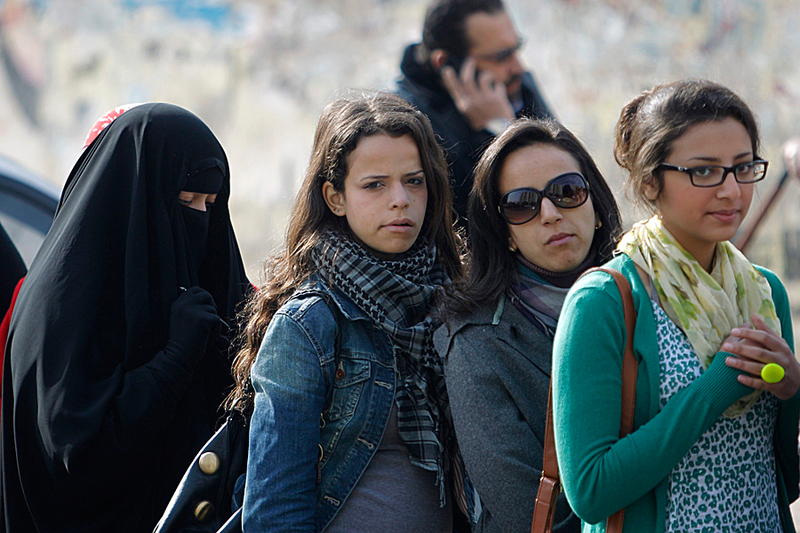 According to the UN, 99% of women in Egypt have experienced some form of sexual harassment. Outrage recently erupted when a woman wearing black trousers and a pink sweater was sexually harassed by a mob while at Cairo University. At last. We also have to thank and recognize the police offficer who took the report seriously and made a case out of it. Let’s hope there are plenty more like him. You go girl, good job to everyone who got involved to teach young men to stop sexual harassment of women. Copyright Egyptian Streets 2014. All content provided on this site is owned by or licensed to Egyptian Streets and protected by international copyright laws. Egyptian Streets and its licensors retain all proprietary rights to Egyptian Streets’ content.Egyptian Streets’ content may not be reproduced, transmitted or distributed without the prior written consent of Egyptian Streets. Blog at WordPress.com.